The quintessence of the Cellar Masters’ expertise on which the company’s reputation rests, Plume Frapin is a cognac made from a blend of about twenty eaux-de-vie produced exclusively from the Ugni Blanc grape variety grown in the 240 hectares of vineyards around Château Fontpinot. This very old Grande Champagne cognac has aged patiently for over 60 years in century-old barrels in the Pierre Frapin cellars. The damp cellars that house our oldest brandies favour the roundness of the cognac. The bouquet is powerful and complex. 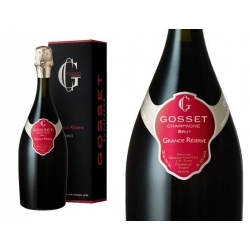 Fruity notes of dried apricot, fig, orange, liquorice and tobacco, with cigar box notes that appear with airing. Woody notes, prunes and candied fruits. The Rancio flavour is well developed and the finish is exceptionally long. The flavour evolves greatly in the mouth. Frapin Cigar Blend Cognac is a single estate Cognac from the region's top 'cru' - Grande Champagne. This was created to match with a cigar.